It's April 15th... that means today is deadline day to file your taxes. Or maybe you've already filed your taxes and received your tax refund but haven't yet spent it and are wondering what to do with the money. Whether you've received your tax refund or are still waiting for it, are you thinking about buying the home of your dreams but aren't sure how to come up with a down payment or closing costs? Maybe your tax refund is your key to buying a home. According to data released by the Internal Revenue Service (IRS), Americans can expect an estimated average refund of $3,143 this year. Many buyers still believe that a 20% down payment is needed to qualify for a mortgage. It's not! Loan programs from the Federal Housing Authority (FHA), Freddie Mac, and Fannie Mae allow for down payments as low as 3%. There are conventional loan programs, also, that allow for a 3% down payment. Veterans Affairs Loans (VA) allow many veterans to purchase a home with 0% down. Down Payment: apply your tax refund towards a down payment. For some home buyers who qualify, combine the down payment from your tax refund with an approved down payment assistance program and you get even great purchasing power. Closing Costs: apply your tax refund to help cover closing costs and other expenses associated with purchasing a home (surveys, inspections, apparaisals, etc.). Buy Down The Interest Rate. Even though interest rates remain lower than a year ago, buying down your interest rate with your tax refund could save you a lot of money over the course of a mortgage loan's life. Pay Down Existing Debt. If your debt to income ratios are a bit high to get qualified for a mortgage loan even though you have cash for a down payment and closing costs, paying down some existing debt with your tax refund could decrease your debt to income ratio and maybe even increase your credit score. Don't forget that your credit score also influences the interest rate you pay on a mortgage. What Percentage Of A 3% Down Payment Is Covered By The Average Tax Refund? In North Carolina, the average tax refund can cover up to 52% of a down payment. In South Carolina, it can cover up to 56% of a 3% down payment (based on the median price of homes sold in these two states). You've heard it before -- homeownership builds net worth and wealth. There are plenty of reasons to buy a home this spring. With low interest rates, now is the perfect time to buy a home. This tax season, your tax refund could just be your key to homeownership! Thanks for sharing! I am amazed how many people think they can't buy a home with some preconceived notions!!! Maybe you've already filed your taxes and received your tax refund but haven't yet spent it and are wondering what to do with the money. Whether you've received your tax refund or are still waiting for it, are you thinking about buying the home of your dreams but aren't sure how to come up with a down payment or closing costs? Maybe your tax refund is your key to buy a home. Sham Reddy good morning, Sham... thanks for stopping by and leaving a comment. I keep coming across many of the same pre-conceived notions in the home buying public year after year. Always amazed that they don't seem to go away. Barbara Todaro good morning, Barbara, and amen to that! Let's face it, getting a tax refund is not a "gift" from the government, but basically an indication that someone overpaid their taxes and have the government a tax free loan for a year. At least if one is due a refund it should be put to good long-term use. 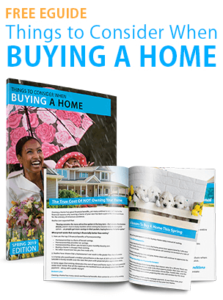 this is a great idea for new home buyers! I like your thoughts and Barbara's about tax refunds! LOL I never have to worry about tax refunds! Lise Howe good morning, Lise. I was just thinking about you this morning and wondering where you'd been recently as I hadn't seen much of you in the Rain. And here you are! We don't worry about tax refunds either, but my husband calibrates our tax payments throughout the year very carefully to ensure we don't over or under pay. Great post and I'm sure you will receive some calls from those finding a tax refund in their new future! Many will find their increase in their refund can help them in obtaining more financial freedom. Dorie Dillard CRS GRI ABR good morning, Dorie. Thanks for popping by... wishing you a great week ahead. These are smart ideas Nina for those lucky enough to expect a tax refund this year! Lawrence "Larry" & Sheila Agranoff. Cell: 631-805-4400 hi Sheila and Larry.... thanks. Wanted to write something around tax filing day that had a postive message. Good morning Nina - this is timely for today. I think that many have used a refund for their down payment. I know of a few cases myself. Grant Schneider good morning, Grant... and happy Monday. Of course, that was the whole idea to post this on tax filing day to underscore the message. As I've often said, there is a method to my madness! Hello Nina Hollander, I agree that the key to your dreams can be the start of a refund and future refunds for that deduction. Nina Hollander my tax return has never been an important part of my purchase of a home but there have been lean years where it really helped me hang on to my home. Bob "RealMan" Timm hi Bob... at the end of the day, whatever works... a tax refund can be helpful to home owners to pay down principal, to home sellers to make needed improvements. Paul S. Henderson, REALTOR®, CRS hi Paul... it's why I say real estate so local and in Charlotte area very hyper-local as well. Then again, most real estate costs more at your end of the world than mine. Will Hamm hi Will... I actually don't believe in tax refunds... if you're getting refunds you've been giving the government a tax free loan for a year. I say balanced out your deductions so you don't owe and you don't lend a lot to the government. But if you do get a refund, then put it to good use.